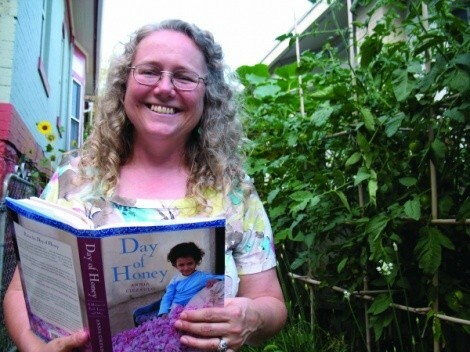 “Food is the thing that makes us most human, the thing that brings us together as a community,” writes Annia Ciezadlo in Day of Honey: A Memoir of Food, Love, and War. Gwen Crist reads the quote to nine people whose ages span several decades—taking part in the August Slow Food Utah Book Club meeting in her living room. Ciezadlo’s point hits home: This is why Crist (pictured), current Slow Food Utah chairwoman, started the club in March 2010. “There are so many great books about food and food-related issues. I just want to read them all and have some people to share them with,” Crist says, adding that the potluck dinner is another bonus. Crist facilitates tonight’s discussion, letting it become tangential, at times—from something similar to kitchen gossip to earnest questions searching for understanding about the whole Sunni-Shiite thing. The “slow readers” nibble from plates full of dolmas, fattoush, mujadara and other Middle Eastern dishes. The aroma is intoxicating. “Books with recipes have the highest attendance. We focus the food around the book, and people really get excited,” Crist says. In Day of Honey, Ciezadlo—an American whose reporter husband was on assignment in Baghdad during the height of the Iraq war—learns to appreciate her surroundings and is grounded through food and cooking. The appendix is recipe-laden; some readers skip ahead to that section. Crist says that’s normal. However, whether they’ve read the entire book or not, everyone adds to the conversation. Some readers are regulars, others first-timers. All are welcome to meetings, and people sign up to receive a periodic newsletter by e-mailing slowfoodsutah@xmission.com. The September book is Lunch Wars by Amy Kalafa, who will appear at The King’s English Bookshop on Sept. 21 at 6:30 p.m. for the club’s next meeting.